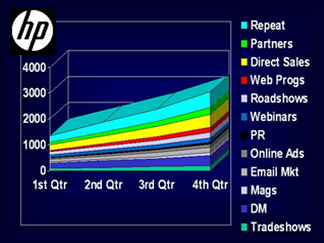 HP had over 90 product lines that were focused on the R&D market worldwide. They were getting complaints that customers were seeing too many single product seminars, webinars and ads. They wanted to consolidate their programs into a market-based, multi-divisional program. I was the first employee hired into a U.S. Marketing center and tasked to prototype this new approach as well as measure its effectiveness. The program started with symposiums in three U.S. regions with five speakers and grew to encompass almost all marketing vehicles, including a new tradeshow, implemented in all parts of the world, that resulted in over $150M in trackable sales. The best type of speakers to use was consultants. To grow the internal investment in sending consultants all over the world, careful metrics needed to be kept on costs, attendance, raw leads, qualified leads and estimated sales. Roadtours: Single room event and a demo area with 2 consultants. Average attendance was 50-100. Metrics were sames as above. Webinar: Was broadcast via Internet. Attendance varied drastically depending on speakers and panel makeup. Metrics: Same as symposium. TV broadcasts: Same as symposium, except it was also used as an on-site tool to capture new prospects at a company. Was often done via educational networks already in place such as Stanford, CSU, etc. Ads: Mainly impressions, responses, and changes in preference. Some qualified leads and PAB. Did preference studies before/after. Potential Addressable Business (PAB) was calculated by multiplying the number of qualified leads by the price of the product. In order to estimate sales, 25-30% of the leads were followed up on with the sales force and channel (direct and indirect) across the world. Sales estimates were calculated based on this statistical sampling. Ratios could then be calculated and modeled for conversions from attendance/impressions to leads, to qualified leads and PAB and then to estimated sales. After two years, models were created that predicted sales within 10-20% accuracy in a stable market.